When you test as many old cameras as I do, you tend to shoot the same subjects a lot. 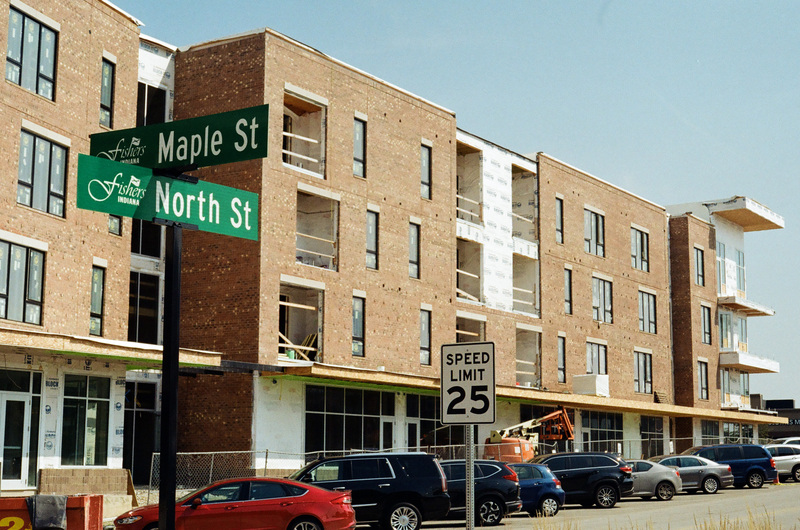 But this one kept changing — because it was being built. 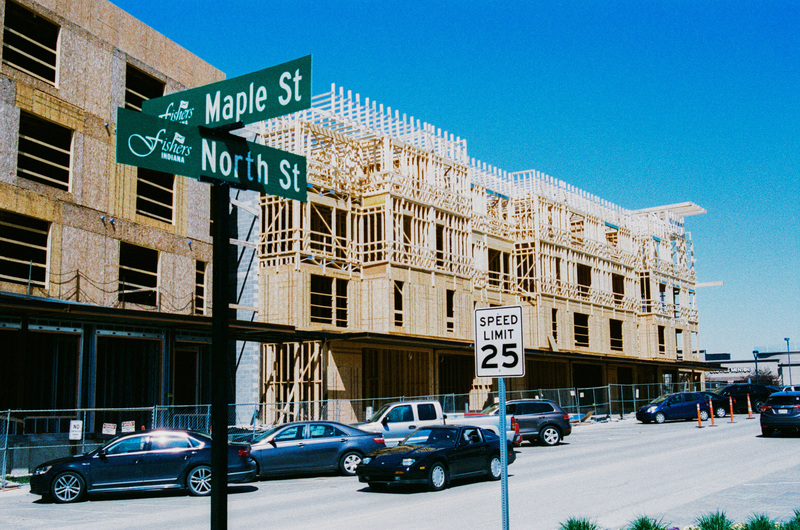 This was going to be apartments and retail spaces, and it filled an entire city block in downtown Fishers. The views are all a little different even though I stood at the same place to make these photos. Focal length, film, and available light all differed. 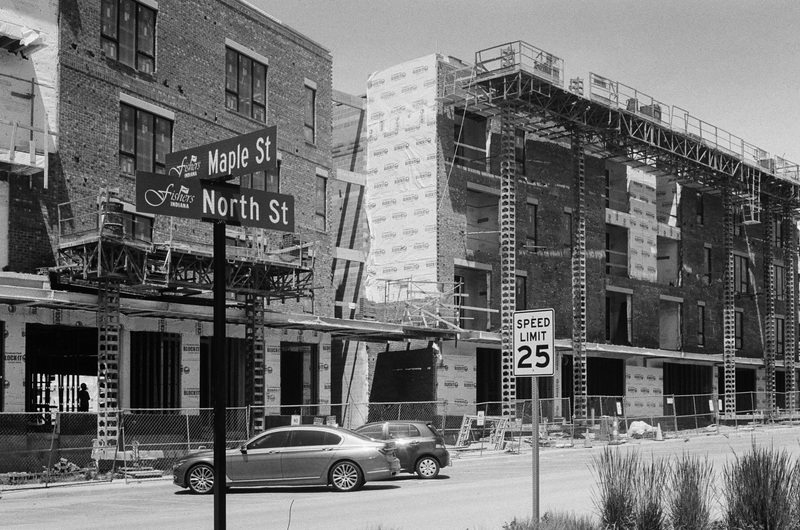 As you can see, construction was well along on that last shot. I’ll bet it’s completed now. But I don’t work over that way anymore so this is all you get! Why have I not used my Olympus OM-1 more? This is such a wonderful camera — compact, precise, capable. It sparked the SLR fever that has so heavily influenced my collection. 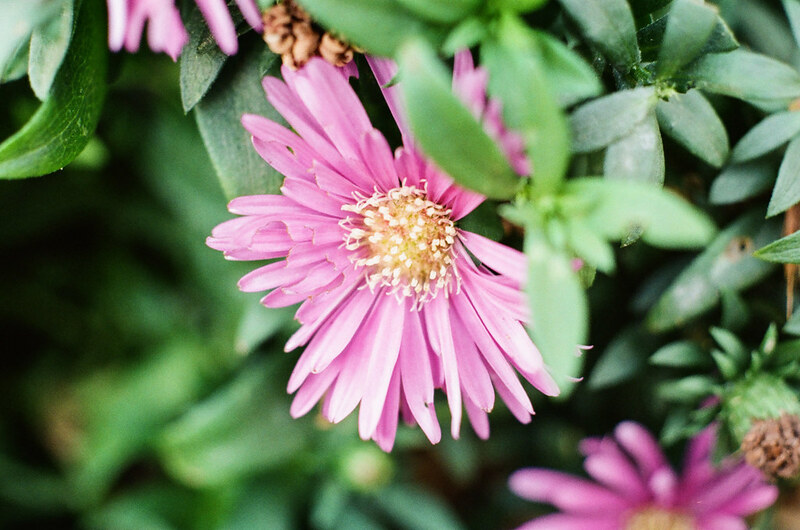 Could my subsequent SLR promiscuity simply have kept me from loving this camera fully? Probably. But I also know I’ve hedged on using it because I never got used to setting shutter speed on the lens barrel. What a wealth of great gear I have that this one little thing led me to favor other SLRs. But really, this is my only gripe. The OM-1 otherwise feels like a luxury item in my hands. Everything about this camera oozes excellence. I own two OM-1 bodies, this minty silver-topped body (review here) and a slightly worn all-black body (review here). I made the above shot with the silver top on Kodak BW400CN, and the shot below with the black top on Fujicolor 200, both with the 50mm f/1.8 F.Zuiko lens. While I shot the silver-topped one this time, I’m including both bodies in this evaluation. They both stay or they both go. These cameras came to me with a bunch of lenses from the father of a dear friend, and I want his whole kit to be a single unit. 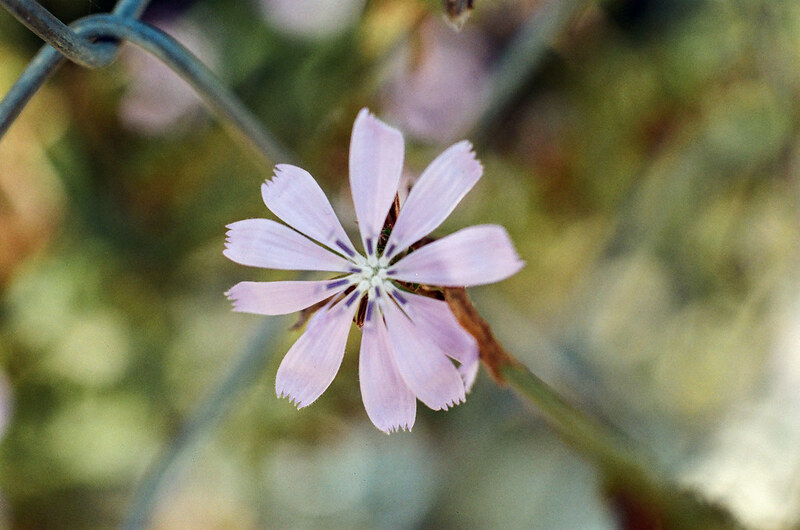 With that, I mounted the close-focusing 50mm f/3.5 Zuiko Auto Macro lens that came with the kit, dropped in some Kodak Gold 200, and went looking for little flowers to shoot. I don’t know why this little blue chicory flower came out purple, but I don’t care, I love the photo. I made these photos as summer was ending. There were plenty of little flowers left to photograph. 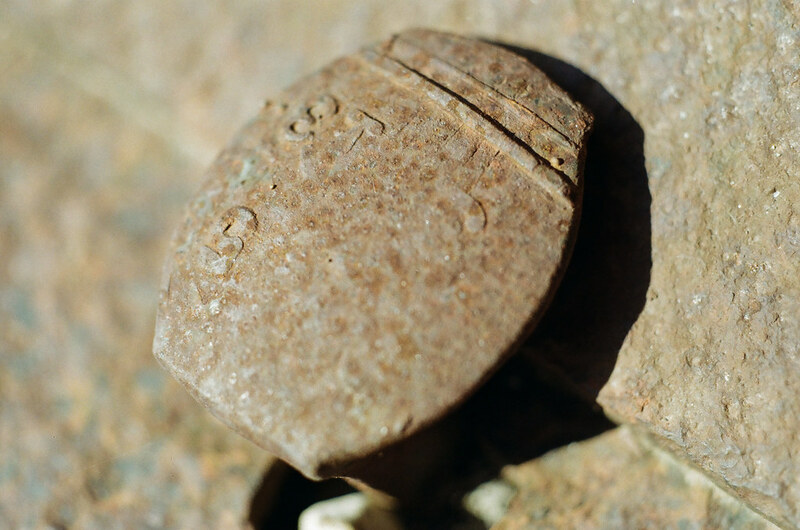 I even moved in close to this railroad spike on some abandoned tracks. I love the colors this lens picked up in the blurred background. I’m not sure my Pentax or Nikon lenses would have seen them. You can use a macro lens for normal work, too. This one acquitted itself well. 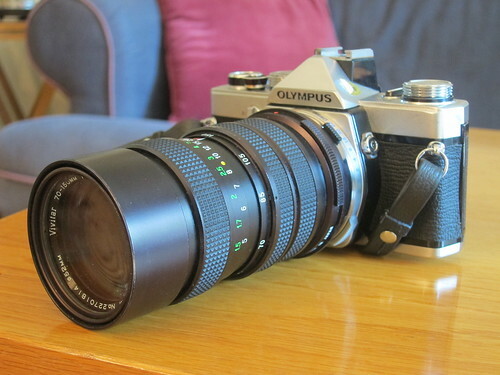 The 50/1.8 and the 50/3.5 Auto Macro were the only Olympus Zuiko lenses in the kit. He also owned a 70-150mm f/3.8 Vivitar Close Focusing Auto Zoom, a 100mm f/4 Portragon, and a big 500mm f/8 Spiratone Mintel-M mirror lens. 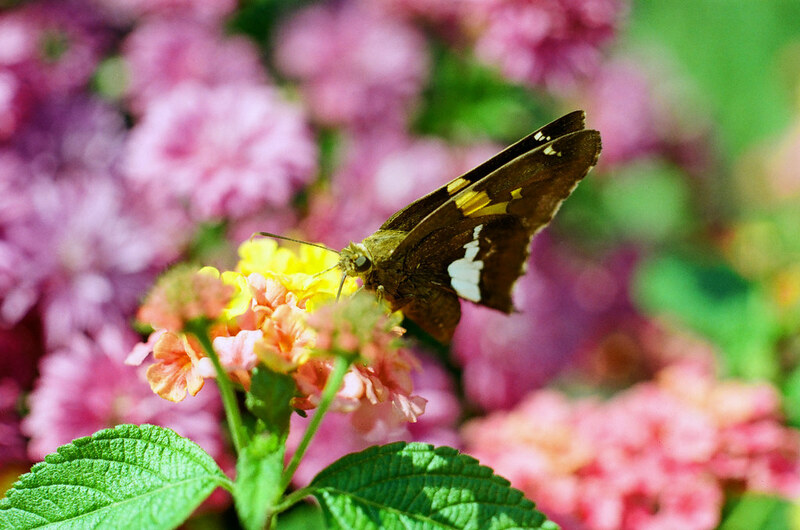 I’d never shot some of these lenses, so I tried them this time on a roll of Fujifilm Superia X-tra 400. 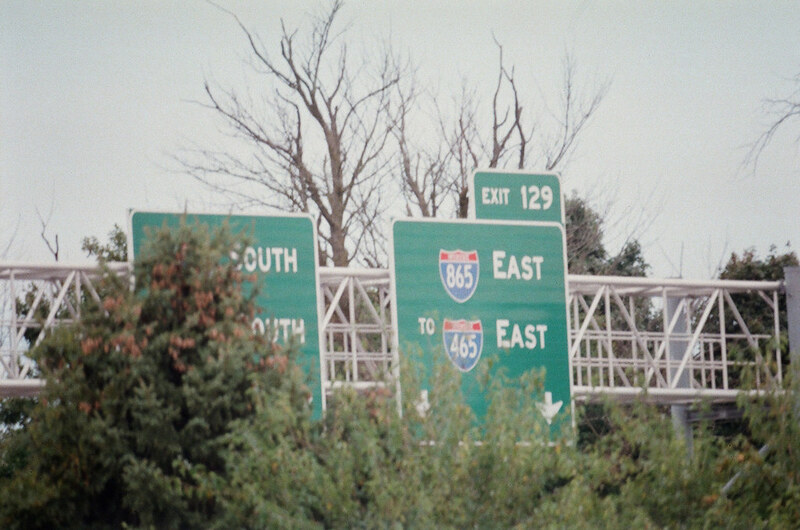 First, here’s a big green highway sign that is about a half mile away from where I was standing. I had to put the camera on a tripod to steady it enough for this shot, which shows the 500mm Spiratone’s resolving power. Which is only okay, by the way. But in its day it was an inexpensive way to get a long lens. Spiratone was a mail-order house for inexpensive photographic accessories. The 100mm Portragon lens is also a Spiratone product. It was meant for portraits, obviously, but I didn’t have anybody handy so I just shot stuff with it. It created an out-of-focus effect around the center of the image. 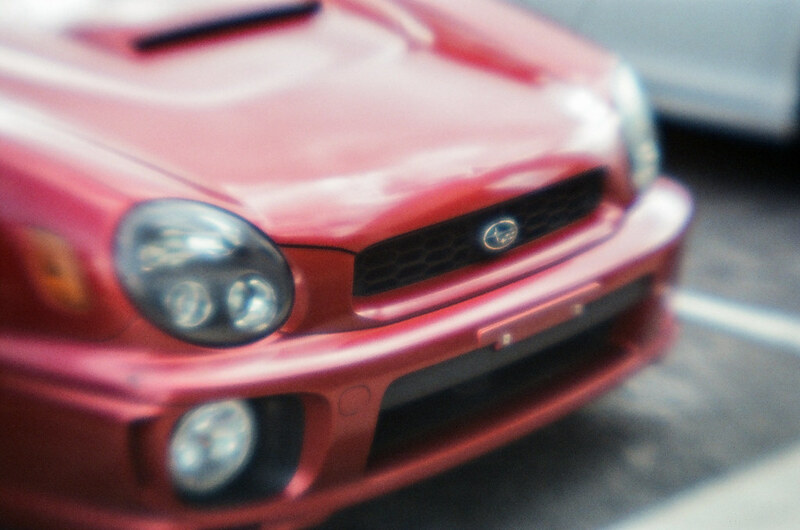 The best of my Portragon shots was of this Subie’s snout. I finished off the roll with the 50/1.8. 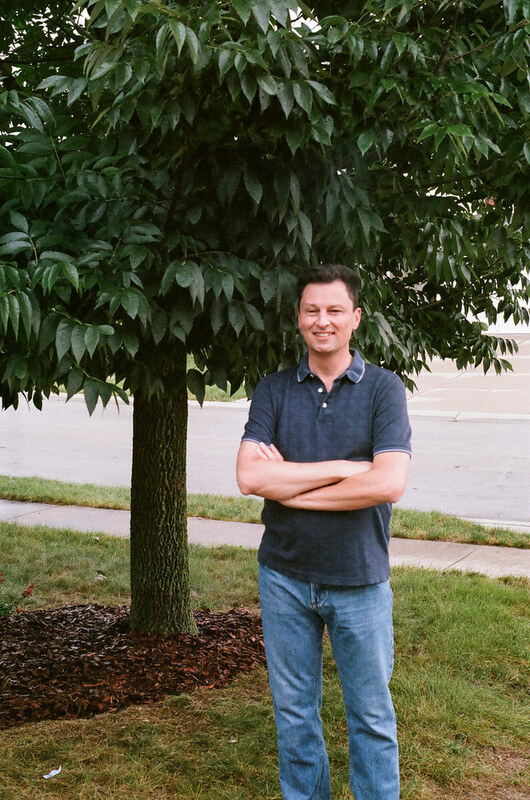 I placed the OM-1 on my tripod, set the self-timer, and got this photo of me in our front yard. Finally, I moved in close to these blue seed balls for one last 50/1.8 photo. 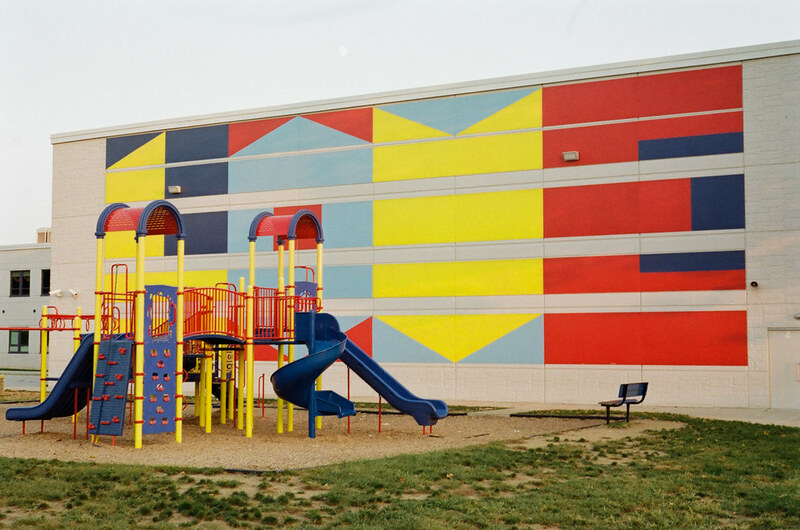 To see more work from this camera, check out my Olympus OM-1 gallery. 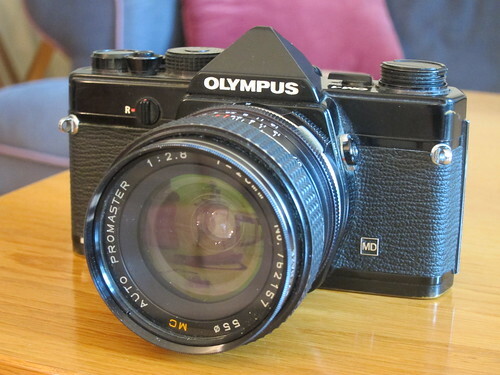 The OM-1 almost makes up for its awkward shutter-speed ring by placing a rewind release on the camera’s front. You turn it to the side and then crank to rewind. Most SLRs place a release button on the camera bottom, and in most cases you have to hold that button in the entire time you’re rewinding. It’s awkward. 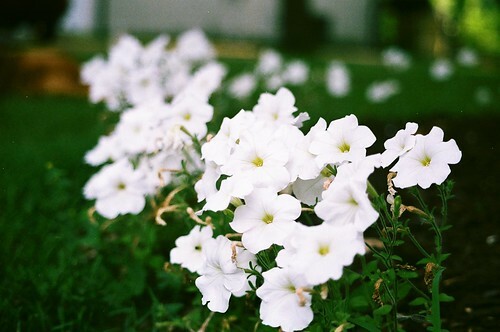 The OM-1’s system is so easy in contrast. While I’m going to focus the SLR portion of my collection on Pentax and Nikon, I won’t part with my OM-1s. I feel like I’m this kit’s chosen steward. And they’re just so lovely to use, weird shutter-speed ring notwithstanding. And so this gear stays in my collection. I love my rangefinder cameras because they’re generally compact and pack great glass. This made them very popular in the 1950s and into the 1960s – but that popularity began to wane in 1959 when Nikon introduced the F, a fine single-lens reflex camera. 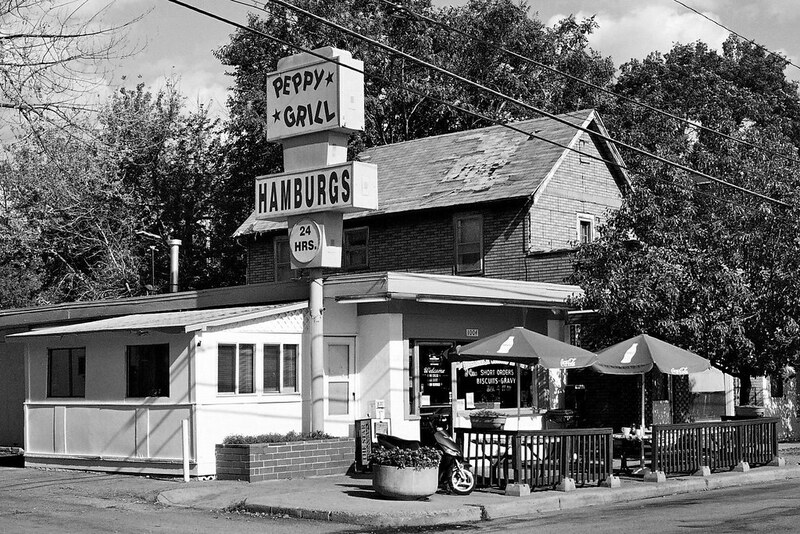 It swung the pendulum hard and persistently toward SLRs. But unlike the once-popular rangefinder, the F and the many other SLRs it inspired were big, heavy, and noisy. 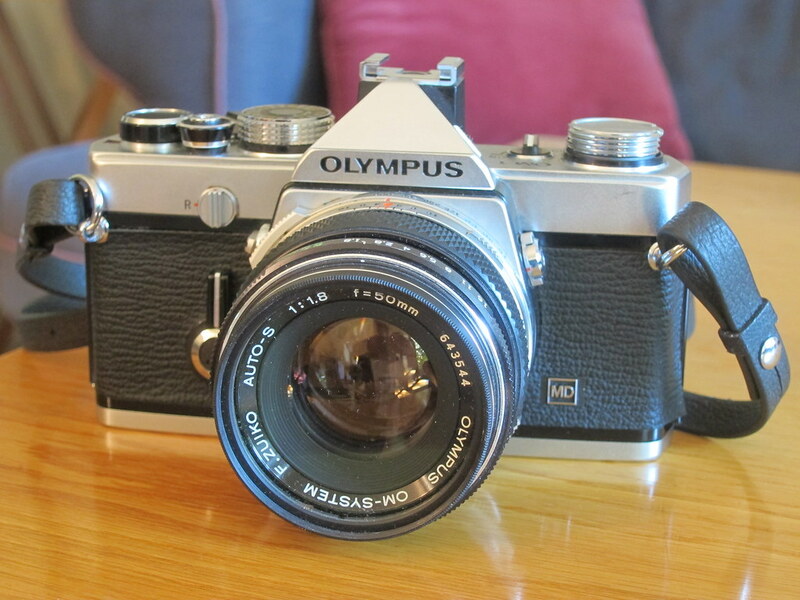 Olympus set out to make a quieter SLR of rangefinder proportions, and thus was born the OM-1. Released in 1972, it blazed a trail that many other camera makers, including Nikon, would soon follow. OM-series cameras were produced for the next 30 years and retained a loyal following for a long time, even as the digital SLR grew in popularity. These cameras still have a cult following today. Two OM-1s joined my collection this year thanks to my friend Alice. (Check out her Web site!) Her father gave her all of his gear several years ago, but she never got around to using it. So she placed it all on permanent loan in the Jim Grey Camera Collection. 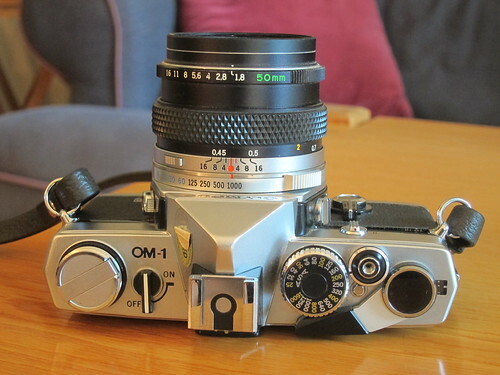 The first OM-1 has a silver top. The standard F.Zuiko Auto-S 50 mm f/1.8 lens is attached. Alice’s dad also kept an all-black OM-1 in his camera bag. I attached the Promaster 28 mm f/2.8 lens to it for this shot. These cameras came with several other lenses, including a Vivitar 70-150 mm f/3.8 Close Focusing Auto Zoom (below), a Zuiko 5 mm f/3.5 Auto Macro, a Portragon 100 mm f/4, and a big Spiratone 500 mm f/8 Mintel-M mirror lens. The bag also contained a Vivitar electronic flash, some lens extenders, a bunch of filters, and other accessories. I’m set for bear. Looking at the camera from the top, it’s easy to see that its curtain shutter operates up to 1/1,000 sec and that it can be set to use film up to ISO 1,000. While the OM-1 is a mechanical camera, it does contain two CdS light meters inside the lens and they don’t work without a battery. It was designed to use the dreaded, banned 625 mercury battery. Fortunately I found two in the bag and they both still worked. When they die I’ll just buy Wein cells in that size and get back to shooting. The light meters don’t drive the OM-1, however. When you look through the viewfinder, a small needle appears near the lower left corner. When you’ve set the aperture and shutter speed for a good exposure, the needle is horizontal, smack dab between the + and – symbols. North of there the photo would be overexposed; south of there, underexposed. On some other OM-series cameras, the meter set the shutter speed for you against your chosen aperture, but of course a photographer needed to cough up extra dough for the privilege. 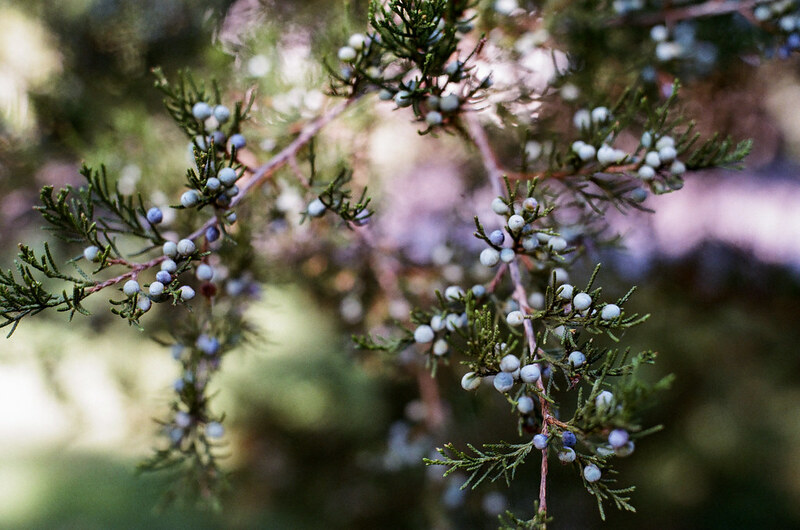 I didn’t miss aperture-priority shooting very much when I loaded a roll of Fujicolor 200 into the silver-topped OM-1. It was plenty easy to twist the shutter-speed ring on the camera and the aperture ring on the lens until the needle lined up, even with my eye planted firmly against the viewfinder. 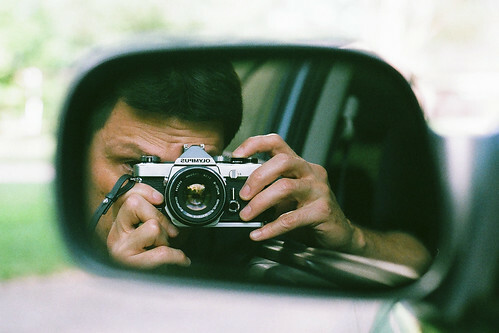 I attached the F.Zuiko 50 mm f/1.8 lens to start, and took this self-portrait in my car’s rear-view mirror. Of course, it’s not a camera post in 2011 without a shot of my petunias. The little golden smudge near the top left is my dog. 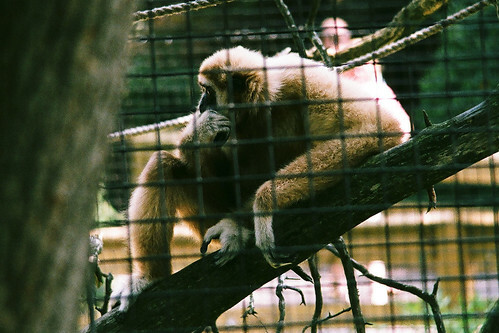 My friend Debbie came to visit, and we went to the zoo. 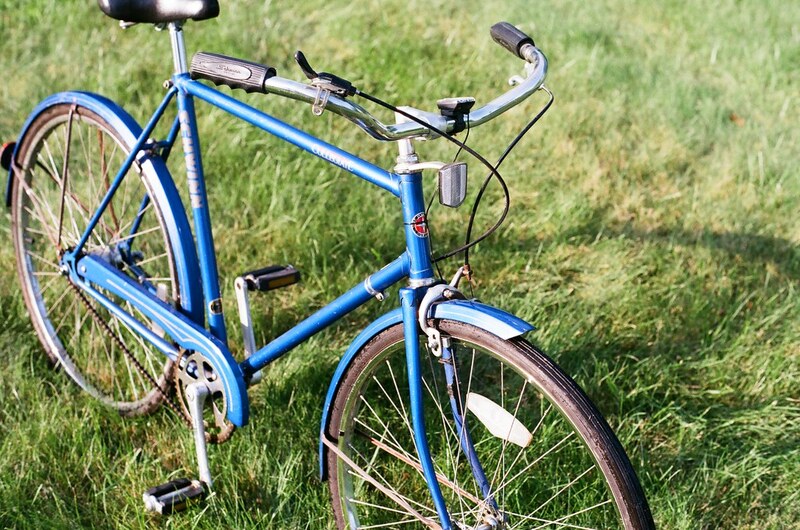 I attached the Vivitar zoom lens to the OM-1 and off we went. 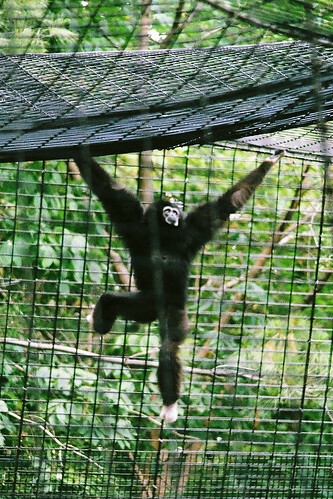 The monkeys were active. This guy appeared to be deep in thought. After all these years I’ve been collecting and using vintage cameras, I’m finally starting to think of myself as a photographer. I look at photographs others have taken that I like and am trying to learn from them. I study my own photos and think about ways I could have made them better. One of my big bugaboos is seeing the subject but not the background. 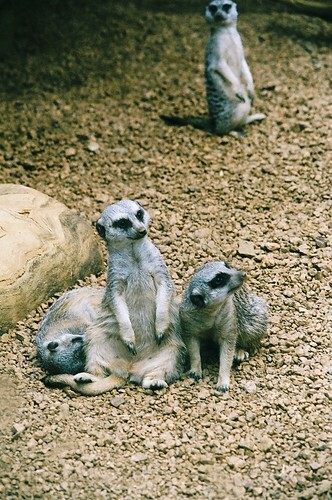 I meant to capture the three meerkats in front, but utterly failed to notice the guy standing up in back. Had I noticed him, I would have moved up a little to avoid cutting off his head – and he would have made the shot. 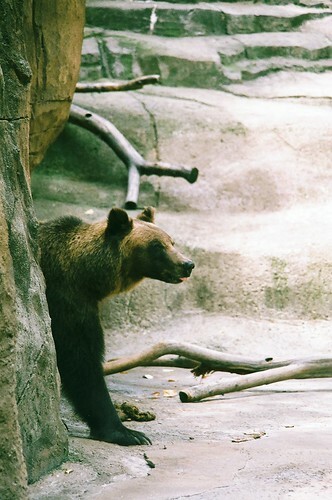 The one time I did wish the OM-1 offered more help was in photographing this bear. Just as I’d get exposure and focus set he’d move quickly away and I’d have to set everything again. This was the only shot I got of him that didn’t have him exiting the frame. I had my Canon PowerShot S95 along too, and though it lacked the deep zoom my OM-1 packed, its auto-everything mode readily captured this active bear. 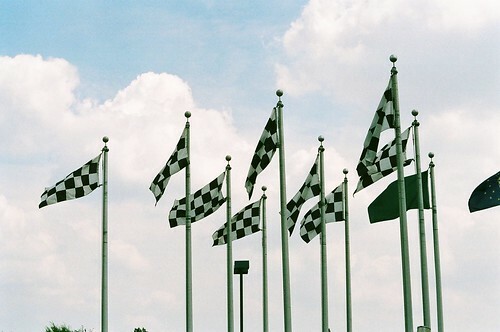 Only in Indianapolis would the zoo post checkered flags at its entrance. In the end, I’m thrilled to own these OM-1s with all these lenses and all this gear. I plan to use one with the stock 50 mm lens just for the pleasure of it and as a means for learning how to take better pictures. Do you like old cameras? Then check out the rest of my collection!